Lovely clear day today, above the Huon Valley fog there wasn't a cloud in the sky at 10am. 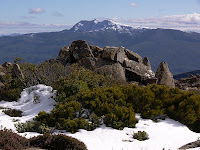 I was keen to have a look at the Hartz in the snow, and I hoped there might be a little less of it than last time I was there. All was good. There was some snow underfoot on the plateau, and more once above Ladies Tarn, but it had been a bit trampled by people who've been up in the last few days, which made it easier in most places. The only tricky bit was the very steep slope up to Hartz Pass, back down much of which which I managed to slide on my first attempt. This was of course a welcome feature of the hill on my return, where I made use of my bum-boggan to make a rapid descent. Good views today, with quite clear air. I was joined at the summit by a bloke who had carried his (quite large) son to the top. I remember carrying my lot up there. The youngest are 12 now, so that stopped a long time ago. Anyway, this bloke agreed with me that the view was indeed difficult to equal. The air was actually completely still for part of the time I was at the summit. I was interested to note that neither the bloke I met at the summit, nor the couple I passed on my return had filled in the log book. None of them were particularly well-equipped either, but then maybe I overdo it. (Although the young lady looked like she was dressed for shopping.) They won't come looking for you just because you're listed in the logbook, but once they've decided you are lost, the logbook would help. The other reason the logbook can be useful is if someone else gets lost - they can find out who was on the track and might be able to help with working out where a lost walker might have gone. As far as the amount of clothing people carry is concerned, today was a nice winter day, and the likelihood of sudden weather changes was low, however, people don't seem to consider what would happen if they were injured. Hartz Lake was partially frozen over with what seemed to be a pretty thin skin of ice. I assume it may have been completely frozen over at times recently. This is a big lake, so it must have been fairly cold for it to freeze over. The ice persisted into the early afternoon today, although the sun was shining on it. As soon as a breeze got up, the waves started to break up the sheet of ice. The mist in the forest on the way there today was really quite attractive. This particular section of the road is not very close to current forestry operations. I heard some quite bizarre bird calls here this morning, and I'm wondering if in fact I was hearing a Lyrebird. Fantastic scenery you've captured. Maybe one of these days I'll get up there. 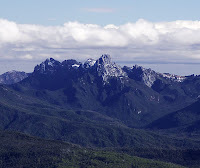 Amazingly clear skies for the Hartz Mtns image, Mark. 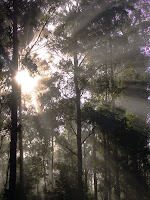 Lovely soft light in the forest shot. Beautiful work on both - oh, and the little circle of non-snow around the plant with leaves poking out. Thanks guys. 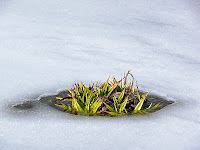 Denis, the vegetation growing out of the "snow" is actually growing out of a frozen tarn. The plant is underwater and probably eagerly awaiting relief. Thanks Steve, hope you are well in sunny Queensland. I thought you would like to see the contrast between your trip there and some solid winter weather. See, it was really quite a mild day when you came...Cheers!